Supports EIA-422 point to point incl. handshake, EIA-485 2-Wire (half duplex) and 4-Wirew (full duplex) connections. Detection of data direction also with half-duplex (2-wire) systems, bus splitting for separate watching of certain bus participants. Output of the bus state (direction, validity) for instance as a scope trigger, recording of external logic signals. The analyzer is simply connected to the bus at any point. By its two ariable operating data decorders it can analyse full duplex bus systems as also two independent half duplex connections, e.g. systems with redundant design. The analyzer is inserted into the bus as works as a router between any two bus segments. The data flowing through it are collected with their direction and clearly assigned to the corresponding segment. An invaluable aid when analysing protocols without direction information. Just select your prefered bus connection when starting a record. The only thing you have to do is to connect your analyzer with your bus according your settings. In this mode the analyzer records all transmitted data independent of source and direction. To get more information about the sender of the data you have to know the corresponding used protocol. This kind of wiring is used for point-to-point connections like EIA-422 but also used for analysis of full duplex EIA-485 connections (as DIN-Messbus, Master-Slave) if you do not need to watch a special bus device singularly and if you can assign the data to the bus participants by evaluating the protocol. The analyzer records two independent 2-wire half-duplex bus systems simultaneously, i.e. applications with a redundant bus design. The analyzer is inserted into the bus and becomes the interface between any two bus segments. The data, flowing through this interface, are collected together with their direction so that they can be clearly assigned to the corresponding segment. If the segment consists of only one bus device, the data sent from this device can be easily assigned to this device independent from the remaining bus communication - even without having to know the used protocol. 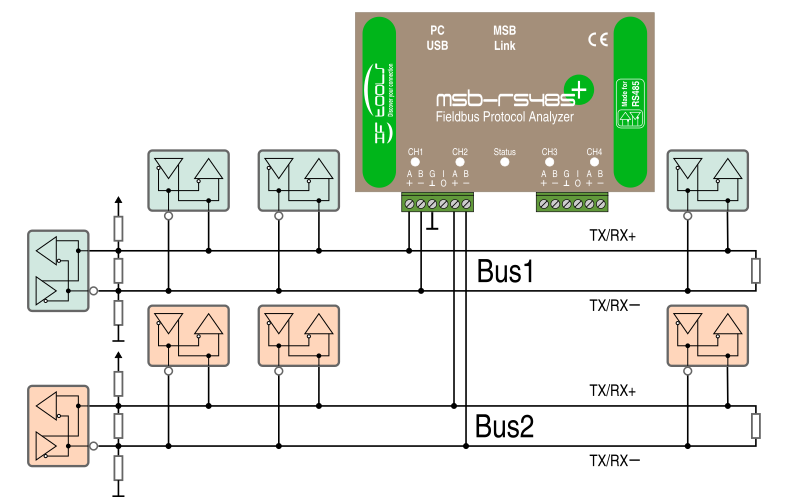 Bus systems with full duplex 4-wire connection (Master-Slave bus, Din-Messbus) also use separate send and receive channels. While the master is connected as sender (Masterbus) to the receivers (Slaves) these return their answers on the second channel (Slavebus) to the master. To monitor the send data from the master a single tapping of the master bus is sufficient. In contrast the slaves share one channel to send their data back to the master. With the help of the segment analysis a singular device can intentionally be separated and its communication with the master monitored without regarding the other devices. The Analyzer provides two additional digital IO-channels which can be optionally used as auxiliary inputs for recording of logic signals (either with internal pull-up or pull down) or as outputs for indication of status information like the bus data direction as well as bus validity.